Medical Metrics, Inc. (MMI) announces the publication of the 150th scientific report featuring its Quantitative Motion Analysis (QMA®) technology. QMA® is MMI’s proprietary radiographic measurement and image enhancement technology that has been extensively validated and used in numerous clinical and research studies of treatments for spinal disorders. Further, QMA® has also been used in many US-Food and Drug Administration (FDA)-regulated clinical trials studying such treatments and is 510(k)-cleared by the FDA. A study showing that QMA® based approach substantially improved classification of instability and measurements of lumbar intervertebral motion: Pearson AM, Spratt KF, Genuario J, McGough W, Kosman K, Lurie J, Sengupta DK. Precision of lumbar intervertebral measurements: Does a computer-assisted technique improve reliability? Spine 2011. A study showing that QMA®-based motion analysis is less subjective and more predictive than CT-based evaluation of pseudoarthroses: Ghiselli G, Wharton N, Hipp JA, Wong DA, Jatana S. Prospective Analysis of Imaging Prediction of Pseudarthrosis After Anterior Cervical Discectomy and Fusion. Spine 2011; 36(6):463-468. A Book Chapter authored by MMI staff members, published in Motion Preservation Surgery of the Spine: Advanced Techniques and Controversies. Edited by Yue J, Bertagnoli R, McAfee P, and An H. Elsevier, New York, 2008: Hipp JA and Wharton ND. 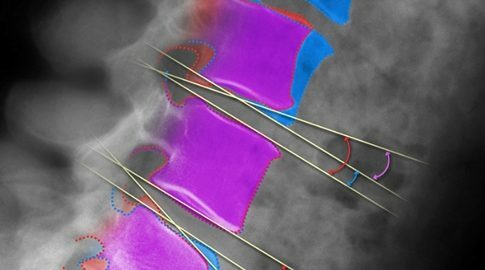 Quantitative Motion Analysis (QMA®) of Motion Preserving and Fusion Technologies for the Spine. An independent validation study of the accuracy of QMA® performed by researchers at the Mayo Clinic, Rochester, MN: Zhao KD, Yang C, Zhao C, Stans AA, An K-N. Assessment of noninvasive intervertebral motion measurements in the lumbar spine. Journal of Biomechanics 2005; 38:1943-1946. QMA® continues to gain widespread acceptance in pre-clinical, clinical and research applications studying intervertebral motion as evidenced by the growing number of scientific publications. QMA®-derived data have been accepted by the FDA as a part of clinical trials involving motion-preserving devices and fusion treatments, including several “firsts to market”. With measurement accuracy validated to within 0.5 degrees and 0.5 mm, this technology is widely regarded as the “gold standard” for quantitative intervertebral motion analysis.